Is this the perfect marriage for the grill? Take a look at what our friends at M&M Perrotti’s Prepared Foods & Butcher Shop have been up to. 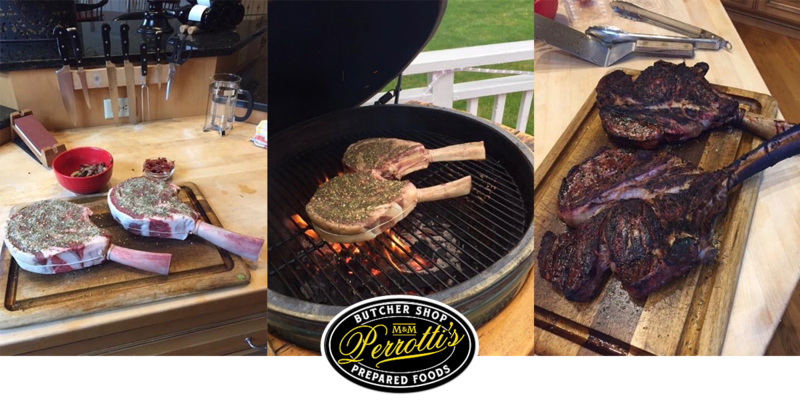 They took these amazing Tomahawk steaks from Simply Grazin’, added our Dos Gauchos rub, and grilled them to perfection. Talk about the perfect way to smash your taste buds with some flavor! If you have a great story to tell, and it involves the use of our spices, rub, or popcorn, share it with us and you might be the winner of a package of Madison Park Foods great products. And when you are in Basking Ridge or Far Hills be certain to stop into M&M Perrotti’s and tell them you saw them on this post! Use this form to share a recipe with Madison Park Foods. Every month a winning entry will receive a fabulous package of our products. Your submission grants Madison Park Foods permission to post a winning entry here.